Advisors who truly want to offer a new value proposition and build strong, inter-generational, multi-advisory relationships throughout personal and financial lifecycles, will want to use a new approach: Real Wealth Management. 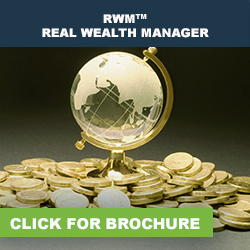 The RWM™ (Real Wealth Manager) is the highly trained strategist whose main role is to co-ordinate the decision-making by all the stakeholders (client and professionals) to accumulate, grow, preserve and transition tax efficient family wealth to provide the client with financial peace of mind. The Real Wealth Manager is a professional who has earned the right to use the RWM™ certification mark after comprehensive training in the delivery of goal-based, client-centric wealth management solutions.